Are you warm? If you’re snowed in, I envy you. But that’s just me, OK? Neighbor K knocked on my door Sunday and handed me a little plastic container and said, “you have got to try this!” She found a breakfast, um, casserole (I hate that word) that had all kinds of things in it, and the crust is chopped up cauliflower. She put some mushrooms and chopped bell pepper in it, and it was pretty darn good. K and I have been going walking very early for the better part of 2 months now. I say better part because we’ve missed a few days–me a week when I was ill, and later, she was hurt and didn’t walk for about ten days. I myself missed two days this week, but I’ll tell you why in a minute. I still have my habit of cooking for a week, and K got the idea to do the same, since after we walk, she takes out Daft Pug for a walk, gets cleaned up and goes to work. So, this weekend she hit on a really tasty breakfast. Of course it’s good! From the page Low Carbing With Friends on Facebook, the Cauli-Hashbrown Breakfast Casserole is full of good things, low carb, gluten free, and just delish. You make a crust of the chopped cauliflower and butter, bake that for 30 minutes, and while that bakes, prep the other stuff. It does call for coconut milk, although I’m not sure why. It takes a while to make, but on a Sunday, bake one of these up and you’ll have it all week and not have to fuss. (As long as you’re single, that is.) If you’re part of a family. . .make two. The deep freeze that gripped Houston last week has eased, and I once again have the patio doors open and the doorstops in place and a nice breeze blowing through the HeatCageKitchen headquarters. I burned fire logs for three days and nights last week, and set up my computer in front of it. Actually, it was just me and the Jezebel the Step Kitty, parked on the futon with my feet up and my little laptop running. I made cappuccino, then made regular decaf and put it in that tall black pipe of a travel mug and camped out there for three days. Not everything I have is hot wings, but she didn’t care, she wanted some. I didn’t close the fireplace damper a couple of times, because the embers were still bright red, and I was afraid of not having any oxygen in the middle of the night. Now, Sunday morning, the weather eased a bit, and I hadn’t lit the fireplace in a couple of days. What I didn’t know is during that cold snap, we got a visitor. He apparently arrived during the night when I left the damper open, and he found his way down the chimney. But he didn’t get far. Jezebel the Step-Kitty was on the prowl. I was watching TV and doing something else when I looked over and saw she was hanging onto something small and grey that looked like a piece of fabric that I tossed aside. (I do that and throw them all away at once.) Irony: I actually WAS cutting grey fabric, no kidding, so I didn’t realize that it wasn’t fabric. She was acting a bit funny, so I got a little closer and realized. . .fabric scraps don’t have tails. This did. Yes, Jezebel earned her keep that day, and became my little mouser. I don’t know how Neighbor K didn’t hear me scream and kvetch at the top of my lungs. I had to chase Jezebel away from the mouse, because she looked like she was going to take it and head under the bed. She gave me a look that said, “Hey–this is mine, go get your own!” When I finally caught my breath (read: quit yelling), I got a small whisk broom and dustpan and put the thing in a bag and set it outside. I did apologize to the mouse for the way his visit went, but I don’t want any mouse visitors, either. K took it out to the dumpster when she walked the Daft Pug. I was so proud of that cat! The GER said she chased a dog out of his house once, too. Good kitty! Our good news didn’t last for long. Jezebel also had problems keeping food down. She was eating, but it wasn’t sticking with her, and in addition to cleaning up the carpet, I noticed she was getting bony besides the big belly on her. I knew she was fixed, so pregnancy wasn’t an option, so off to the vet we went. It was a beautiful day, we hopped in my ride and drove to a great vet clinic in Pearland. I told her that they were going to take care of that super-duper hairball she had, and it was all going to be OK.
Well. . .she was carrying something–a “huge mass” on her left side that was pushing her organs over to the right. The vet mentioned “lymphoma,” and it took up her entire left side. The vet showed me the X-rays, and could not believe what I was seeing. That’s why she couldn’t hold food down, and she was actually starving. Frantic calls to the GER voice mail went unanswered, until finally, he called back, and drove to Pearland to meet me at the clinic. 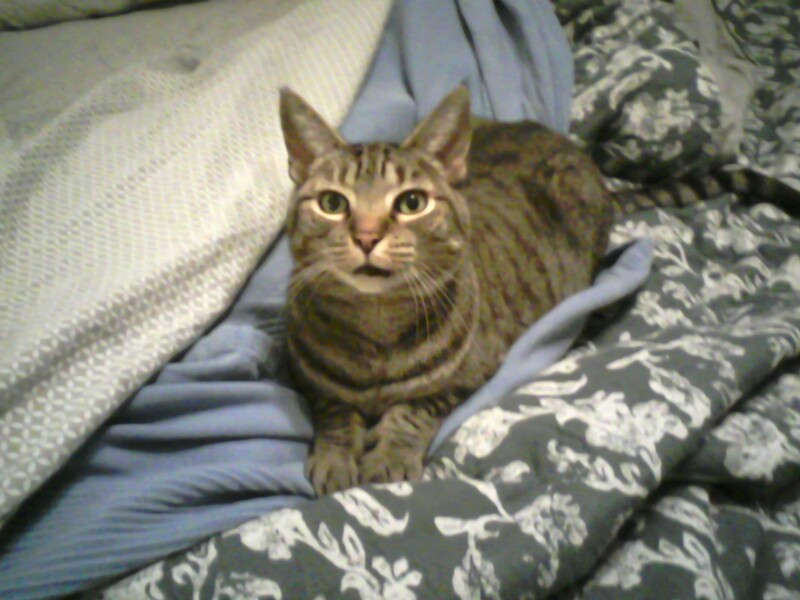 The prognosis was not good, and on that day, (11/17/2014) our little mouser went to the Rainbow Bridge. 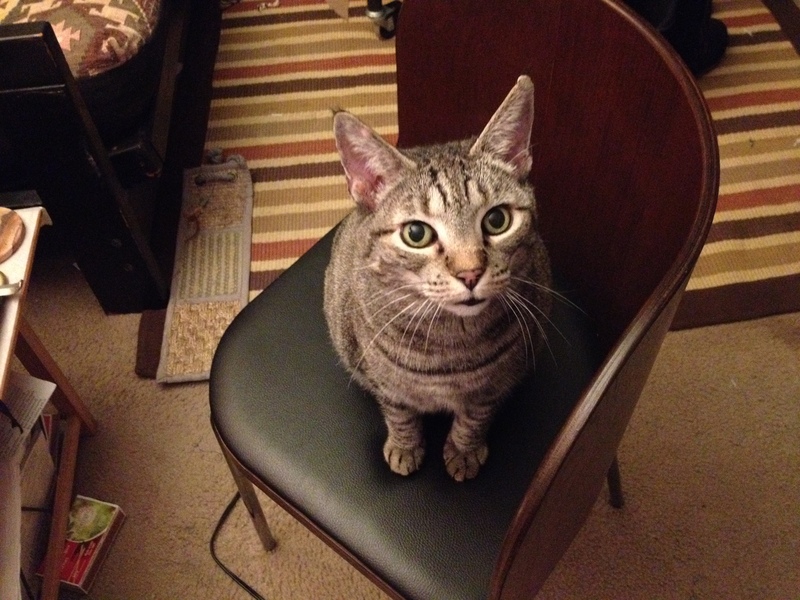 The GER and I said goodbye to a fussy, independent little tabby cat that suddenly was the only cat in the world. And for the first time in 21 years, I am living alone, without a cat. She was gone, just like that. I feel bad that I didn’t give her more roast chicken, turkey and little bowls of milk. She got to be a little bit pushy after the hot wings, and I figured she was just being a chow hound. No. . .she wasn’t well. I thought she was just pudgy with a big hairball. Goodbye, Jezebel. See you again at the Rainbow Bridge. Don’t worry, there’s plenty of delicious food there for you, too. Your Cat Daddy and I miss you very, very much. We know you are out of pain, and happy with new friends there. Jezebel the Step Kitty. Independent, but wanted attention on her own terms. And, whatever you’re having, please. I’ve washed up her food dishes and put them away, but I just don’t have the heart to get rid of her litterbox or kitty bed, nor that little scratch pad on the floor on the left of that picture. I took down the little tin sign outside that says “Mind the Cat.” I’ve also gathered up as many pictures as I could find of her and put them in a DropBox file to share with the GER. I’ll go look for more this weekend, but I fear I’ve lost more because I didn’t realize my photos weren’t being backed up to my iCloud. I’m hoping GER has some at home that I sent him previously. We’ll get some prints made soon, too. Please remember to be nice to your pets, and always, always bring them in when it’s cold. They’re our pets, they love us and trust us, and they can’t help themselves.